Explore the incredible legacy of these two intriguing countries, from magnificent monuments immortalising the pharaohs in Egypt to the footsteps of the Romans and Nabateans in Jordan. Natural wonders abound, from extraordinary desertscapes to soaring mountains, world-famous seas and, of course, the mighty Nile. Delve into the wonders of Egypt and discover the Great Pyramids and the Sphinx at Giza before marvelling at the ancient temples, tombs and monuments at Luxor. 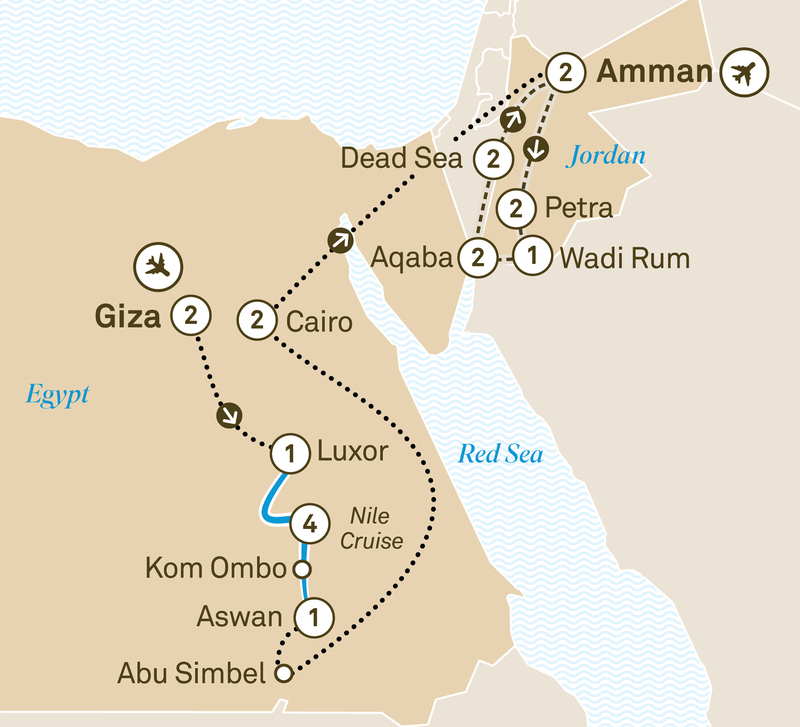 Glide along the Nile on a luxury cruise to Aswan and stand in awe before the extraordinary temples of Abu Simbel, then top it all off with the treasures of Cairo’s Egyptian Museum. In the Kingdom of Jordan, discover the capital Amman before travelling to the World Heritage-listed city of Petra for a spine-tingling exploration of the incredible Treasury and ruins. Marvel at the moon-like desertscape of Wadi Rum before relaxing by the azure waters of the Red Sea, and floating in the hypersaline waters of the Dead Sea. Fly to Amman, the capital of the Kingdom of Jordan, for two nights. Join your Jordanian Tour Director for a dinner of local delicacies.